Snowy is an exceptionally white wire Fox terrier. 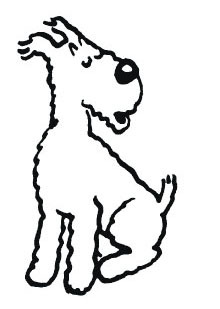 In French, Snowy is called Milou.The name came about thanks to a girlfriend of Hergé, Marie-Louise Van Cutsem, who was called "Milou". "Snowy is always there alongside Tintin. They talk to each other. Even though he speaks, Snowy is above all just a normal dog. Even though he talks a great deal, he remains a simple dog for Tintin. Tintin and Snowy are totally on the same wavelength even when they are in conversation". (The key characters in Numa Sadoul, Tintin et Moi, p.240). Even if Snowy gives the impression that he likes to set-off on another adventure, he in fact prefers the peaceful life. Being both generous and faithful forces him to follow Tintin, who is always on the move. Snowy's flair and courage will often save Tintin from imminent danger. Sometimes Snowy succumbs to temptation. Especially when food is concerned. He remains curious and let's not forget that dogs have their own instincts. However, when courage is required, you can rely on Snowy to help his master. "It is not difficult to find similarities with Captain Haddock, bad tempered, talkative, irritable and stubborn, boastful, blunderer and unlucky". (The key characters in Numa Sadoul, Tintin et Moi, p.240). The arrival of Captain Haddock in the Tintin adventures will lead to Snowy being less talkative. In a sense, Snowy will be replaced by Captain Haddock. Snowy enjoys wearing certain outfits, a fur-coat for when it is freezing, a space-suit. Sometimes he dresses-up just for fun!